When deciding to participate in any exhibition or trade show, or even hosting an event, there are a lot of factors to be taken into consideration like cost, visibility and commercial pay-off. Your exhibition stand should showcase your products or services to the best advantage, enhance your brand, and ultimately lead to more business opportunities. The placement, design and organisation of any exhibition stand or booth, all play a critical role in attracting visitors. Remember, depending on the size of the trade show, there could be anywhere from dozens to hundreds of other companies all competing for attention. Many times, companies or agencies working on behalf of corporates can be frustrated because despite investing time and money in developing a design concept, booking space and developing promotional materials, the exhibition stand does not reflect the company or the brand. It is important, therefore, to ensure that you’ll be hiring a qualified exhibition stand builder with standardised processes, methods and resource planning, and a highly proficient team who will handle the projects. At Electra, we have dedicated project and account managers who will create and oversee the whole project planning and execution. This will guarantee regular updates on the project status at every stage and support until its completion. Don’t wait until the last minute to discover that not all exhibition stand contractors in Dubai are alike. In the final analysis, put to one side the expense, the time, the preparation, it all comes down to the quality of the execution. The top professional event production companies or exhibition stand builders in Dubai and across UAE deliver the premium quality others do not or cannot. Quality is the sign of true artistry or craftsmanship; the attention to detail that can be seen in a carefully hand-sewn seam, or the brushwork of a master painter. American writer William A. Foster once wrote: “Quality is never an accident; it is always the result of high intention, sincere effort, intelligent direction and skillful execution; it represents the wise choice of many alternatives”. Any company that invests time, money and effort in an exhibition or trade show wants this to benefit its business. 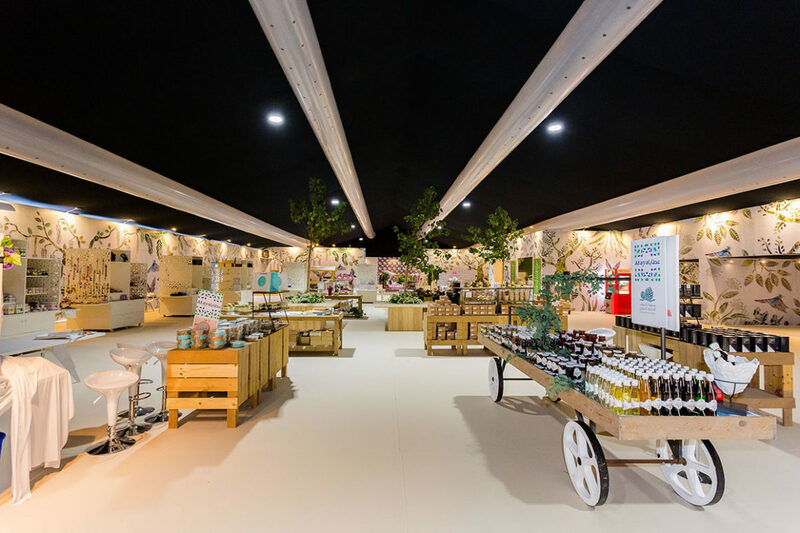 An exhibition stand or booth is a visible reflection of a company’s values, the way it thinks about itself and the way it serves its clients, the choices it makes and how it delivers on its promises. Quality, therefore, should be the main factor when making any of the hundreds of possible choices that accompany participating in an exhibition or hosting an event, including factors such as the concept, design and execution. 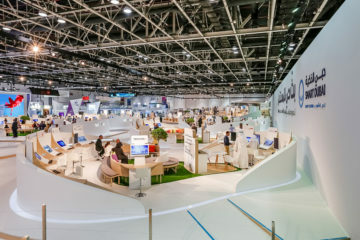 In a previous post, we shared some tips on how to choose the best exhibition stand company in Dubai, where we highlighted some of the nightmare scenarios that can occur if you don’t hire a reputable and reliable exhibition stand contractor. Now we want to look more closely at the quality issue because it is an essential component of success. 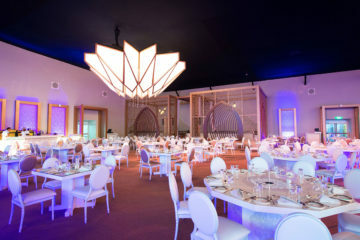 At the end of the day, you can make all the right decisions, but not get the effect you desire, because the exhibition structure or event venue is the core element of your presentation, you need to be 100% sure that it will be constructed, laid out and furnished to the highest standard possible within your budget. If you cannot answer in the affirmative to the following three questions, you may be in trouble. Have you picked a partner who is dedicated to delivering high quality finishing? Did you hire an exhibition stand builder who understands the importance of details in creating an overall impression? Can you rely on your contractor to deliver your vision on time, on budget and according to specifications? A quality stand or event depends not just on the design but on the quality of the build, that’s why every event production company in Dubai must remember this quote from legendary Hollywood producer David 0. Selznick, most famous for “Gone with the Wind”: “The success of a production depends on the attention paid to detail”. When you are organising an event, you are creating a show, a display, an experience for your existing and potential clients. You want them to be engaged, interested and comfortable. Lack of attention to detail and poor-quality control can lead to such issues as shabby furniture and fixtures, sloppy painting, uneven surfaces, and seams, loose fittings, poor joinery, cracks, dents and many more. The presence of any of these flaws can create exactly the opposite impression of your company, rather than being professional, thoughtful and organised. A poorly-executed build can make you look disorganised, careless and unreliable. Rather than enhancing your brand, it could damage it. This is certainly one case where people will judge a book by its cover. The overall quality finishing of an event production or exhibition stand expresses a company’s brand in concrete terms. This covers not only constructing the venue in the case of temporary structures, tents and marquees, but also interior fit out. 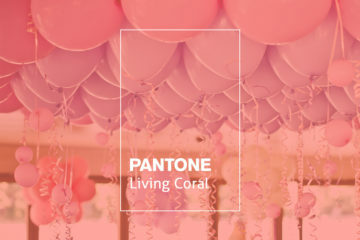 Creating a comfortable, attractive and inviting interior space requires care and dedication, including painting, carpentry, lighting, temperature control, furniture rental and decorative elements and accessories. Outcome: The complex assignment involved more than 300 staff members working over 2 months on a full range of project management services, including workflow planning, construction and execution within severe time constraints. 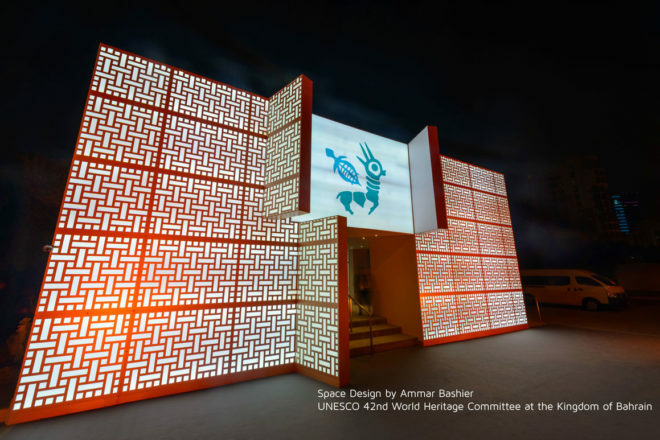 The result was a unique conference venue with elegant and professional interior fit out that translated the Arabian – Middle Easter design concept of Ammar Bashier. 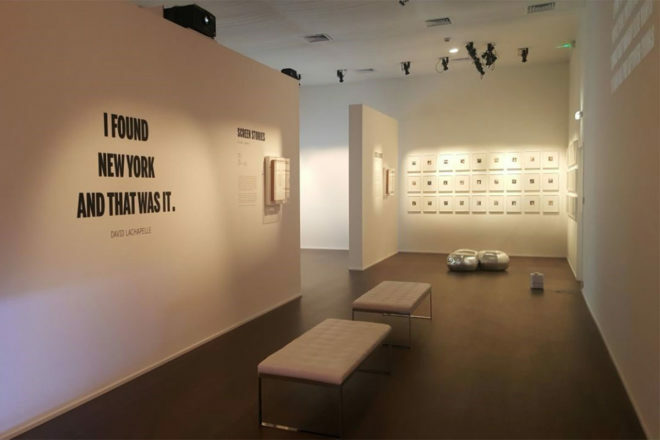 Challenge: Create a unique, modern and striking setting to house the exhibition, while ensuring that displays were protected from local high temperatures and humidity. Outcome: Aesthetic quality was ensured by extreme focus on finishing and detail, including painting, lighting, and display assembly requiring experience in museography. Thus, we’ve created innovative structure, providing total waterproofing, and 24/7 temperature control. 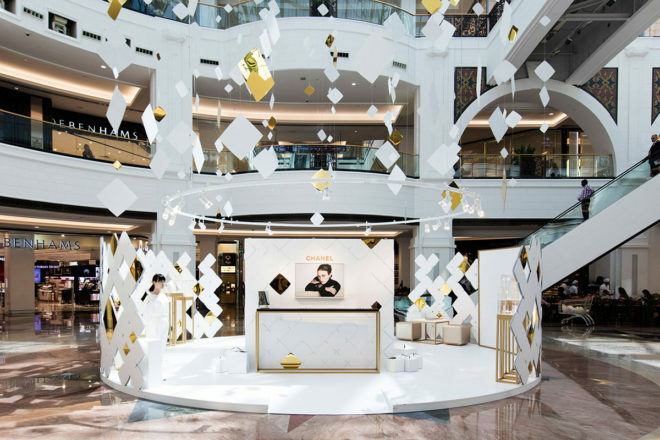 Outcome: We’ve realised the high-fashion concept in white matt & gold acrylic finishes with 400 hanging items suspended from ceiling, attracting and welcoming shoppers and passers-by. An exhibition stand pop-up event or booth makes a statement about a company. It must express your values and mission – your brand. Successful exhibition stands can generate vital brand buzz, increase sales and enhance customer engagement. 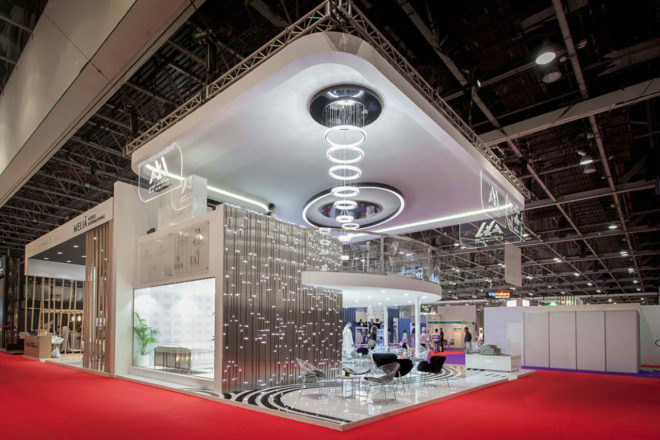 Quality finishing for events and exhibitions is not only an inescapable requirement in the UAE but also internationally. This makes the choice of an exhibition stand contractor in Dubai extremely sensitive. Make sure that you have a partner that can handle the responsibilities of managing a complex assignment efficiently, while paying careful attention to all the details of construction, decoration, layout and furnishing.